There is a type of contemporary architecture that seems to frequently find it’s way to our office – we call it soft contemporary. 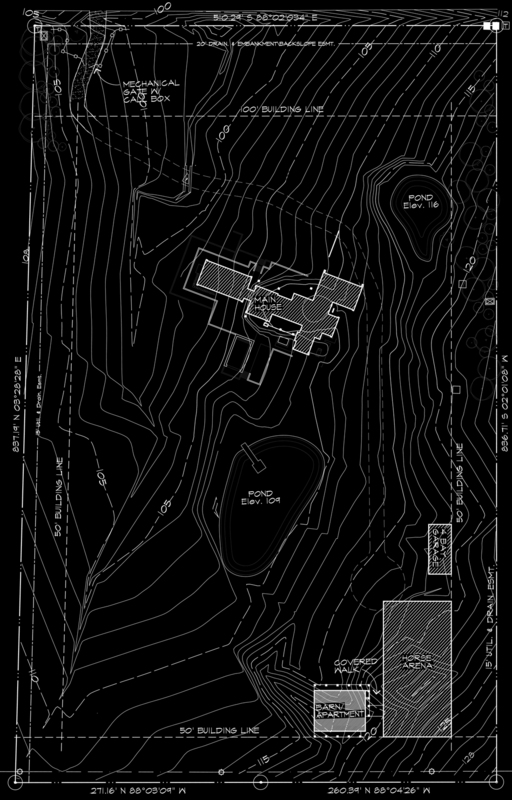 This project is an example of a client who wanted the clean lines and accessible geometry you typically find in contemporary architecture, but in this case, we removed the formulaic rigidity typical of most contemporary homes so that the homeowners interests and lifestyle can play a larger role in how the spaces are used. This house is located about an hour north of Dallas, Texas and is a working horse farm – complete with it’s own stable and riding arena. The main house is 4 bedrooms, 6 bathrooms and 6,327 square feet. I think the pictures speak for themselves but I wanted to point out a feature that isn’t readily apparent … the lack of fences on the property. All the animals on this farm have the ability to roam wherever they choose to go so the house was designed in such a way as to create barriers to control where the animals aren’t wanted without having to resort to using fencing. The house was sited to take advantage of the natural grade so that a series of terraced retaining walls and landscape features were constructed so that the views from the house onto the property were unobstructed. Children's Playhouse 2011 - Complete!